With school starting up, fall is definitely not far away. However, it's just as warm now as it was during the summer. What's the perfect article of clothing to make the transition from summer to fall with? The 2fer tank dress! If you've been following my blog since at least January of this year, you may remember the article I wrote about 2fers during the winter. Even though it's warmed up since then, 2fers have remained popular throughout the spring and summer. Most notably, the 2fer tank dress. 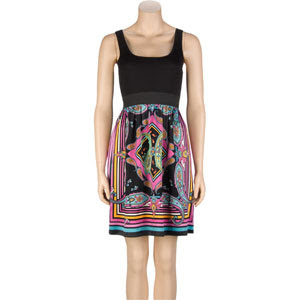 You have probably seen these dresses all over clothing stores everywhere. If you're not sure what I'm talking about, a 2fer dress is when the top and the skirt are sewn together but look like they can be separate pieces. 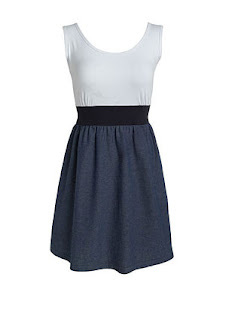 A 2fer tank dress is always sleeveless and the top will be a different color or pattern from the skirt of the dress (many of them are in colorblock or two-tone styles as well). Sometimes, there will be a belt in between the top and the skirt. I personally think these dresses are really cool and they are showing no signs of going anywhere for the fall. I will explain how to wear them for when it cools down, but in the meantime, take a look at some of the fabulous 2fer tank dresses I found online. So, how exactly are these dresses perfect for making the transtion between the warmer and cooler season, you might be wondering? It's all in how you style it. On a warm day wear a 2fer tank dress with a bib necklace, bangle bracelets, and a pair of gladiator sandals. When the weather cools down, wear this dress with a cropped cardigan sweater, a pair of leggings or tights, and some slouch boots. The latter tip is also good to follow if you're school has a dress code that does not allow sleeveless dresses (the cardigan will solve that problem) or short skirts (if you want to wear one of the shorter dresses to school, wearing tights or leggings underneath should make it ok; you might want to check with your school first just to be sure though). 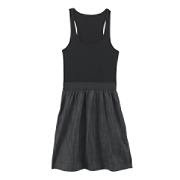 Speaking of school, for those of you who haven't gone back yet, a 2fer tank dress would be perfect to wear as part of your back to school outfit for the first day. You will definitely earn straight A's in fashion. If you want to create this look on your own, grab a solid colored tank top and a high-waisted skirt in a contrasting color or pattern; then tuck the tank top into the skirt. It will look just like one of the gorgeous dresses above. If you have any more ideas for what to wear on the first day back at school or what pieces you can transition from summer to fall with, let me know. E-mail me at Charmed42787@gmail.com or write to me on myspace. Yeah, I'd like to own all of them too. If only I was rich. Nice dresses! I really like that frill trim dress from Forever 21! I'm glad you like the dresses. 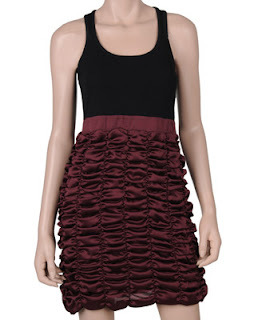 I like the Forever 21 frill trim dress too. It's so girly and fun, plus I love anything with ruffles or frill! Hi Fashion Doll! Thank you for reading and commenting on my blog. I'm glad you like the pink and black dress. I will definitely check out your blog! Super duper cute!! Not to mention ingenius!! I want them allllll! Hi KMW! Thank you for reading and commenting on my blog. I'm glad you like all of the dresses.